A £25m East Midlands railway station is failing to meet projections it would attract 743,000 passengers a year. East Midlands Parkway (EMP), which is located near Junction 24 of the M1, achieved a 19% increase in use in 2012. But according to figures from the Office of Rail Regulation, it was used by 261,880 passengers - just 4% of the passengers who used Nottingham station. A spokesperson for East Midlands Trains said the projection was devised before it won the operating franchise. They added the station would prove "vital" when Nottingham Station closes for six weeks in July for engineering work. The station was ranked 27th out of the region's most-used stations, behind towns like Stamford, Mansfield, Hinckley and Skegness. Bettina Lange, chair of East Midlands Transport Activists Roundtable (Emtar), said: "I am totally unsurprised the station is not meeting its target. The target was unrealistic. "The station is in completely the wrong place. It's basically a big car park surrounded by fields and a power station. It's not near any population centre. It's miles from Nottingham and it's miles from East Midlands Airport. "It's very difficult to get to the station unless you drive. East Midlands Trains promotes the station by saying you can get cheap train tickets and there's ample parking, but that's not the right way to go about things. I would have preferred to have seen that £25m invested in other East Midlands stations." The station, which took 10 years to build, was aimed at encouraging more people to use the rail network instead of motorways. Rushcliffe Borough Council, which oversaw the planning application, said: "We received an outline planning application in 2000 and the detailed application was approved in October 2007." It said the passenger projections given in the 2000 application were for numbers around 743,000, based on the station opening in 2001. In the end, the station did not open until 2009. The spokesperson added: "Statistics for rail travel may have changed during that time, either up or down - we have no way of knowing this." A spokesperson for Network Rail, one of the parties that worked on the planning application, said predicting passenger figures was not "an exact science". "The recession may have had an impact but we expect passenger figures for EMP to continue to grow," she added. 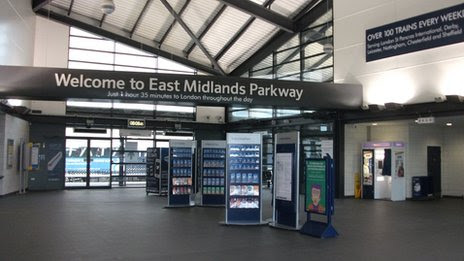 A spokesperson for East Midlands Trains said: "The planning application for EMP was submitted by Network Rail and was before East Midlands Trains won the franchise in November 2007. Therefore these are not our figures." It said that the figures from the Office for Rail Regulation failed to take into account Megabus journeys, which transport passengers from Yorkshire in coaches on to trains for London. Taking these passengers into account, they said passengers numbers for January - September 2012 were 480,000.